Managed Detection and Response in real-time and around-the-clock. With the industrialization of cybercrime, cybersecurity has become a hot topic from breakrooms to boardrooms. Protecting your network has many moving parts and is an around-the-clock production. When choosing a cybersecurity solution, compromises are often made due to competing business demands. Decision makers are forced to prioritize other business needs, putting the company’s data at risk. Even when decisions are made with the best intentions, alerts pour in, while the day-to-day operations compete for the team’s attention. The cost of highly trained personnel, hardware and maintenance can be pricey and difficult to budget for. It’s time to get ahead with CloudJacketX’s advanced threat detection. Our Security-as-a-Service eliminates labor intensive log analysis and alert fatigue allowing you to focus on your business. 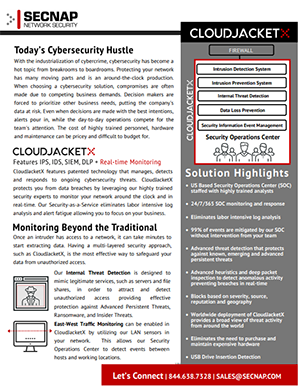 CloudJacketX protects you from data breaches by leveraging our highly trained security experts to monitor your network around the clock and in real-time. SECNAP’s Line of Defense. Your Line of Defense. Investment in cybersecurity is wise. SECNAP has developed technology which uses advanced heuristics and deep level packet inspection to detect anomalous activity preventing breaches in real-time. CloudJacketX blocks known and unknown threats based on severity, source, geography and customized threat blocking based on your business needs. Our security analysts are dedicated to identifying, confirming and blocking threats. 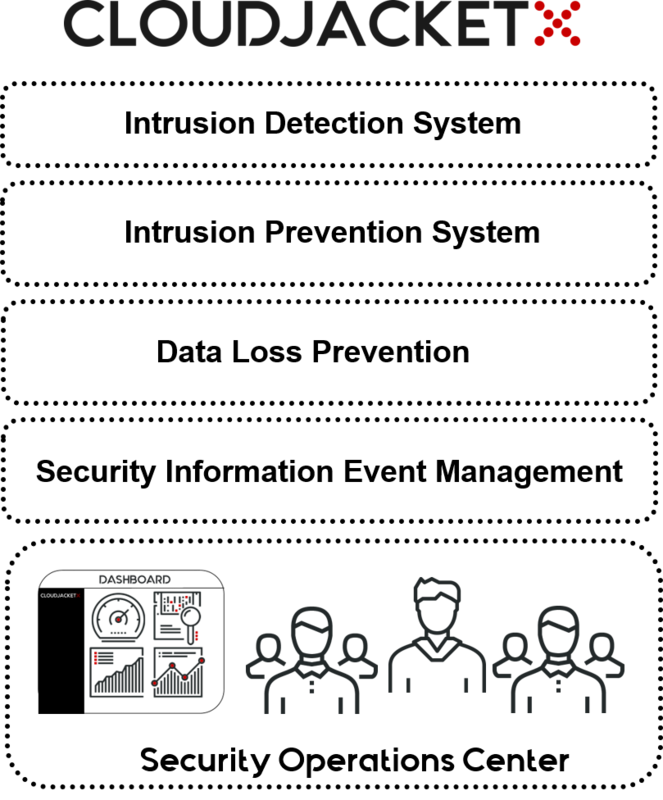 Less than 1% of alerts will actually need any intervention from your team. This frees up your inbox from unread alerts and eliminates labor intensive log analysis. Our internal threat intelligence is designed to mimic legitimate services in order to attract and detect unauthorized access. This solution consumes a hacker’s time and attention with data that is customized with realistic business details. Internal Threat Detection is designed to provide effective protection against insider threats, ransomware and advanced persistent threats. Working around-the-clock our highly trained security analysts vet potential threats on your behalf. The team will get to know your business policies and tailor our service to ensure that security does not interrupt legitimate business. Our analysts supply real-time dashboards and snapshot reports including those needed to maintain compliance. 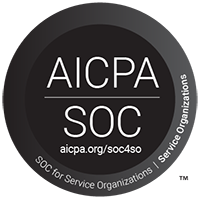 CloudJacketX is a SOC 2 compliant solution and our SOC is based out of a datacenter in the US. We value customer service and like to think of our SOC experts as an extension of your team. 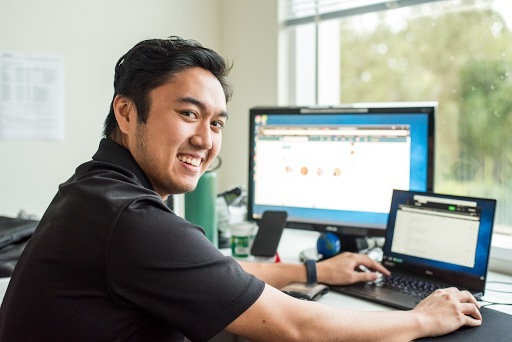 Meet our Security Operation Analyst who can review your network events so you don’t have to. Let's Prevent Breaches in Real-Time. Get started with a robust security solution that will cure your alert fatigue.